Here is a screenshot I took while I was working recently, to document a fascinating project. The project involves resurrecting a bit of technology from the 1600s. In the screen snapshot, I am entering numbers into a text file. I am copying the numbers, as you can see, from a digital facsimile of an old book that contains some curious latin writing. 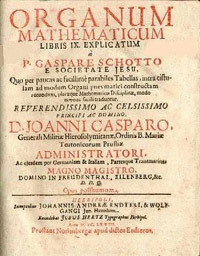 The numeric tables in the book are copies of tables that were inscribed on wooden rods and stored in a box, or ark, called the Organum Mathematicum. 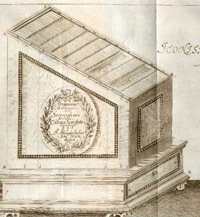 The Organum was invented by Father Athanasius Kircher, the Jesuit polymath, and described in detail by Kircher’s disciple and associate, Kaspar Schott, in a 1668 book named after the device. The tables I am copying come from this book. 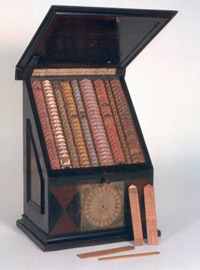 The Organum, a kind of primitive slide rule or abacus, aided various kinds of mathematical calculations, including multiplication, fortifications, horology, astronomy, astrology and so on. It was meant to be used the way we might use a laptop computer. Like a modern laptop, it contained a distillation of various bits of knowledge in a convenient form. There are 10 sets of rods in the Organum, and the 10th and final set of rods allow non-musicians to compose music for church services. The rods contain short musical phrases that are intended to be combined together to create longer pieces. It is the data on this 10th set of rods that I entered into my own laptop computer. A few of these Organums still exist, including this beautiful late 18th century model in the History of Science Museum in Florence. You can see some of the rods, which have been removed on the lower right. There are also existing versions of a related device, the Arca Musarithmica or Arca Musurgica which contained tables for music only, and had a larger set of music tables than the Organum. This device was described in detail in book 8 of Kircher’s massive tome, Musurgia Universalis (1650), shown below, with the fold-out illustration of the Arca. I mentioned this book a couple of weeks ago, in connection with Cuckoo Clocks. 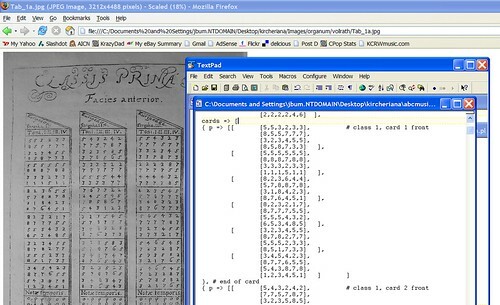 I am in the process of writing a computer program that executes Kircher’s instructions for composing music, using the tables or tariffa in these two books. My program, is a Perl script called Organum. You provide the program with a few parameters, such as the title of a particular hymn that you wish to set to music, or a particular set of tables you wish to use, and it does the rest, randomly combining various musical phrases from these tables (according to Kircher’s instructions) and assigning pitch and rhythmic values from the tables. The program is basically working now, but still needs a little more data and some finessing. I have a complete set of tables from the Organum, but do not yet have complete set from the Arca. Here is a sample of music produced by Organum. Organum outputs music in the ‘ABC Plus’ format. There are some great open-source utilities for converting these files into sheet music and MIDI files on the ABC Plus web site. Here is a sample 4-part vocal score produced by my Organum, using some of the other tables from Kircher’s Organum. 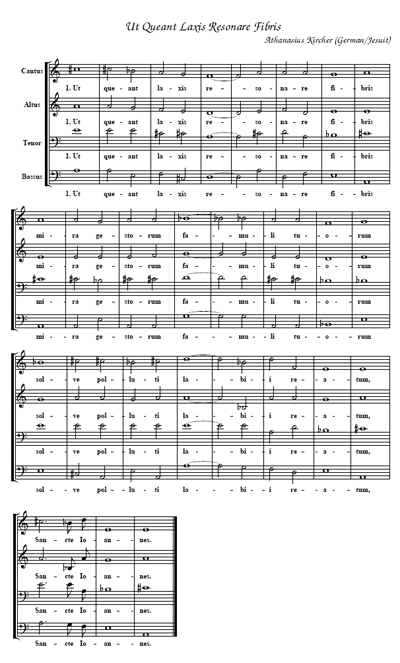 Here I have used the Organum tables to set the words to the hymn Ut Queant Laxis Resonare to music. Coincidentally, this is the hymn from which we get the musical names “DO RE ME FA SOL LA SI,” originally “UT RE ME…” — these are the first syllables of each line of verse. Ut Queant, is in Sapphic meter, containing lines of 11, 11, 11 and 5 syllables. There is a set of tables in the Organum for setting hymns in this style, as well as 3 other popular styles (in 1650). 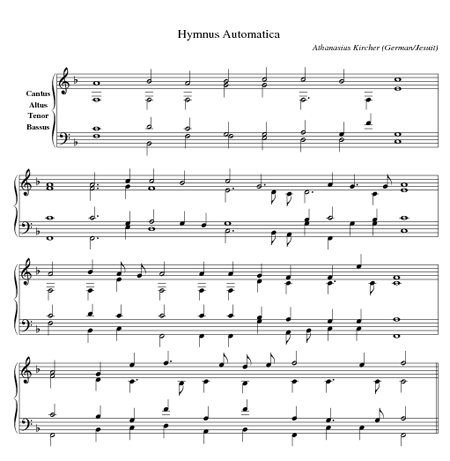 Most latin hymns are Ambrosian or Gregorian, and are in iambic tetrameter, having 8 syllables per line. 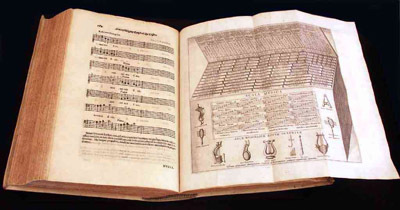 Kircher refers to these as Archilochean verses, and provides tables for setting them in two different musical styles: the stylo simplico, or 1st species counterpoint, and the stylo florido, or 5th species counterpoint. Which of 8 modes or scales (Dorian, Lydian etc.) to set the piece in. The choice of pitch phrases for each strophe of verse (typically 4 strophes, each with 6 or more phrase choices). The rhythm to assign to each pitch phrase (6 or more per strophe). Because of all the possible combinations, the Organum (and my software) is capable of producing about a million pieces of music. Of course, since the music is generated from a small set of source phrases, and is intended to create polyphonic hymns in a particular style, its expressive range is limited. Nonetheless, by substituting the tables, it would be possible to use Organum to generate music in other well defined styles (with correspondingly limited expressive ranges), such as ragtime, or 50’s rock & roll. Of course, algorithmic composition has come a long way since 1650, and there are newer and better ways of accomplishing this, such as David Cope’s Experiments in Music Intelligence. Nonetheless, Kircher’s algorithm has a very similar result to a method used in modern computer-aided compositions: Markov Chains. In this style of composition, you analyse existing pieces of music for their statistical properties, recording which groups of notes are likely to follow other groups of notes. You then use this information (which is a kind of digest of the original piece) to create new compositions in the style of the original piece. Because Kircher has recorded little snippets of music in the tables in the style he wishes to emulate, the result is very similar to what you get with Markov Chains. Eventually, I hope to build a physical Organum or Arca to house my software. The box will resemble the real thing, and will contain wooden rods, which trigger hidden switches which operate the software. The box will have a MIDI output in the back and will be used in live performance. All in all, an interesting project which combines a number of interesting disciplines, including computer science, music, history and art. I would like to thank Dr. Hans-Joachim Vollrath, professor of Mathematics at the University of Wurzburg (where Kaspar Schott once taught), for his assistance in providing photographs of the tables in Organum Mathematicum. You can learn more about the Organum and its other, non-musical capabilities, at Vollrath’s excellent website. I will post more files, including my perl scripts, when the project is a little closer to completion. This entry was posted on Sunday, April 2nd, 2006 at 5:20 pm	and is filed under Jim's Projects, Linkydinks. You can follow any responses to this entry through the RSS 2.0 feed. Both comments and pings are currently closed.